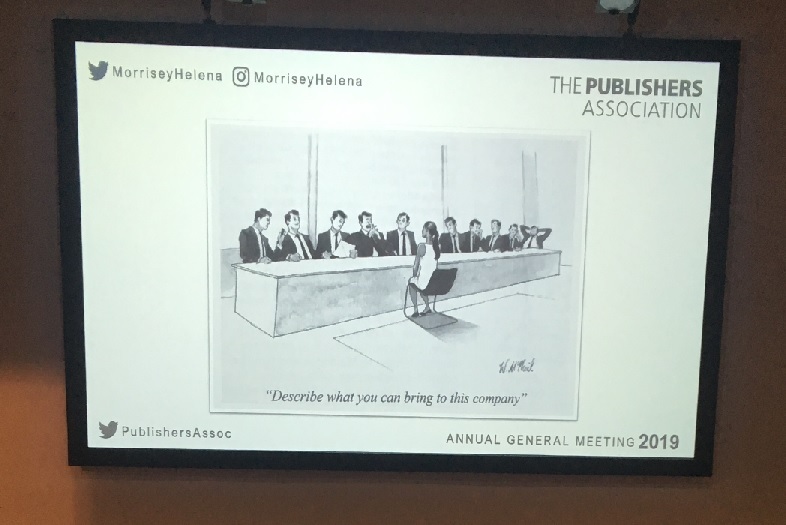 This week the Publisher’s Association had their annual general meeting, and after the formal proceedings were over – we were invited to hear from Stephen Lotinga, CEO of the Publisher’s Association, the incoming President and CEO of Cambridge University Press, Peter Phillips and Dame Helena Morrisey, Head of Investment at Legal & General, and diversity champion. Stephen kicked-off the evening by highlighting the success of the industry in 2018 and how this year the PA will focus on ensuring the UK’s copyright system is working as it should, emphasising the power of the publishing industry in the UK’s economy and ensuring open access is possible for all publishers. As incoming President, Peter wants to focus on diversity, intellectual property and everything in between! He recalled a presenter on the today programme saying publishing feels like it is from another century, but what they didn’t talk about is how the future generations will benefit from publishing for a long time to come. Copyright is a huge focus for the PA this year – it was invented to allow sharing and dissemination of content which has helped the publishing industry become an economic powerhouse. Peter also talked about how publishing is also a huge contributor to learning and knowledge and how copyright underpins our ability to create and reward learning and innovation; with this in mind, publishers are energetically seeking innovation by constantly using new technologies and finding new ways to deliver content. This is opening up books to new consumers and we are using machine learning to measure usage and discoverability! Stuck in another century? I don’t think so. As an industry we are champions of technology and innovation and we are constantly evolving for the future! Dame Helena Morrissey took to the floor for the keynote speech; with over 30 years’ experience in the finance industry, Helena is now Head of Investment at Legal & General and throughout her career has challenged diversity in the financial services sector. In 2010 she launched the 30% club, an initiative to broaden the pipeline of women at all levels of organisations. In the hedge fund industry, there has been phenomenal improvement from 7% of women on boards in organisations to 31% in 9 years. Helena talked passionately about diversity, and how there is a need in every business to challenge ourselves and welcome diversity of thought, although this is not something that comes easily to everyone. She talked about how diversity initiatives fail because people are talking amongst themselves, rather than speaking to the person in power – women talking to women about issues for example. Helena said we must now focus on the need to change the system, and to treat diversity as a pre-requisite for success – not just a nice to have. The digital age enables new ways of working and the 100 year life heralds a new career plan, we need to change the chronology, change our behaviour and see diversity as diversity of thought. So in a practical way, what can business leaders do? Helena urged business leaders to hold a mirror up to themselves, and to their organisation in order to identify cultural and behavioural issues, make bold commitments and hold people to account. We need to measure progress, and be involved, not just delegate. Diversity is an issue that needs to be seen as mission-critical. Finally, Helena gave an example of the ‘recruitment challenge’ – if you set candidate A & B the same task and one scored 8/10 and the other 4/10 – who would you hire? The natural choice would be the higher score, however – what if the candidate who got 4/10 got the two questions right that the other didn’t? Isn’t that the person you should hire? The person who will bring true diversity to your organisation. Diversity is clearly still a big focus for the publishing industry and these practical ideas from Helena will be really useful in defining our thinking moving forwards. Inspired Selection recently ran a session at the London Book Fair on Diversity and Inclusion as well as spoke with Emma House at the Publishers Association about the changing workforce and how publishers are adapting – listen to this here. If you missed the session at London Book Fair you can hear our live podcast here.